iTunes Store, as one of the largest video vendors in the world, offers over 190,000 TV episodes and 45,000 films available for downloading. A large number of people download videos from iTunes for enjoying. But, to our disappointment, all iTunes downloaded videos include usage restrictions enforced by FairPlay and the majority of iTunes videos are encoded as M4V format. So, many people seek to convert the iTunes DRM-ed videos to common MP4 formats to free the iTunes videos from any restriction. Currently, the unique yet most efficient way to convert iTunes M4V to MP4 is to use some powerful M4V Converter. But if you googled for how to remove iTunes DRM or how to convert M4V to MP4, then you'll probably be bombarded with a mass of DRM Removal Tools and M4V Converters in the market, all of which are pushed and publicized with attractive descriptions and powerful functions. You may feel puzzled which one to choose. Here, we have elaborately selected three powerful M4V converters for you to successfully convert iTunes M4V to MP4. When it comes to the professional iTunes M4V Converter, NoteBurner iTunes M4V Video Converter may come into your mind. With an innovative DRM decrypting technique, this program is able to remove FairPlay DRM from iTunes rented and purchased videos and convert the M4V videos to plain MP4 format at 20X faster speed. With the super fast speed, you can convert a 2-hour HD movie in 15 minutes. Besides, while choosing output format as "Same as source for mp4" or "Same as source for mov", you can convert iTunes M4V videos with high-fidelity image which gives you better visual experience. What's more, NoteBurner M4V to MP4 Video Converter can convert iTunes M4V videos with multilingual subtitles and all audio tracks kept, including 5.1 audio track. Keep original subtitles, audio tracks, and lossless image quality. 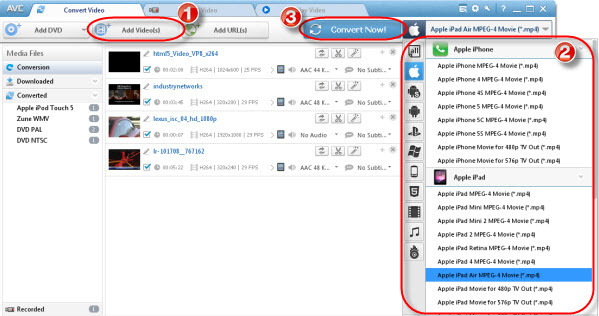 Learn More: How to Convert iTunes DRM Protected M4V to MP4 with NoteBurner DRM M4V Converter? Any Video Converter Ultimate is an all-in-one Video Recorder, DVD Converter, Video Converter and Audio Extractor. It is not specialized in converting iTunes M4V videos, but it is still a great choice for you to convert the iTunes M4V movies with DRM protection to DRM-free MP4 if you have both iTunes and other DRM-free videos to convert. Unlike NoteBurner iTunes M4V Converter which adopts an innovative DRM decrypting technique, Any Video Converter Ultimate uses the recording method to convert iTunes M4V videos to MP4 format, which takes more time to convert iTunes M4V videos. Convert both iTunes DRM-ed M4V video and other plain video files. Not professional in converting iTunes DRM M4V videos. Aimersoft DRM Media Converter provides Windows users with excellent and full audio & video DRM removal solution. Not Only can you convert iTunes DRM-ed M4V videos, but you can also bypass digital copyright protection from WMV and ASF video downloaded or media files purchased from Windows Media Centre, Zune Marketplace, BBC iPlayer, Xbox Live Store, Amazon Instant Video, ect. But, as we all know that there are always two sides to a coin, so does Aimersoft DRM Media Converter. Though it can convert all DRM-ed media files, it takes more time to convert iTunes DRM-ed M4V videos than the professional iTunes M4V Converter, such as NoteBurner M4V Converter Plus. Convert video and audio files to tons of formats. Take much time to convert. It is hard to get these three iTunes M4V Converter ranked. All these three software has their own merits. Specifically speaking, NoteBurner iTunes DRM M4V Converter is specialized in removing iTunes DRM and converting iTunes M4V videos to other DRM-free formats. It is absolutely your top choice if you want to convert iTunes rented and purchased M4V videos to DRM-free formats. But if you want to convert all your videos including DRM-ed iTunes M4V videos and DVDs, Any Video Converter Ultimate is definitely the best tool for you. Of course, if you prefer to converting different types of DRM protected media files, Aimersoft DRM Media Converter will take the upper hand. All in all, which one to choose is all up to your conversion requirements. To better strip iTunes DRM and convert iTunes M4V to MP4, you'd better choose the professional iTunes M4V Converter - NoteBurner M4V to MP4 Video Converter.